Another stunning day today; a few light clouds around the horizon signalling high pressure but otherwise beautiful blue sky. We also have a little more wind so Askari has 'stiffened up' and have been trucking along really well for the last couple of hours. We didn't connect yesterday afternoon as we only have so much connection time to the sailmail system and we brought in a large long range weather forecast yesterday morning to be sure we were happy with continuing on; before the Cape Verde Islands were out of reach. 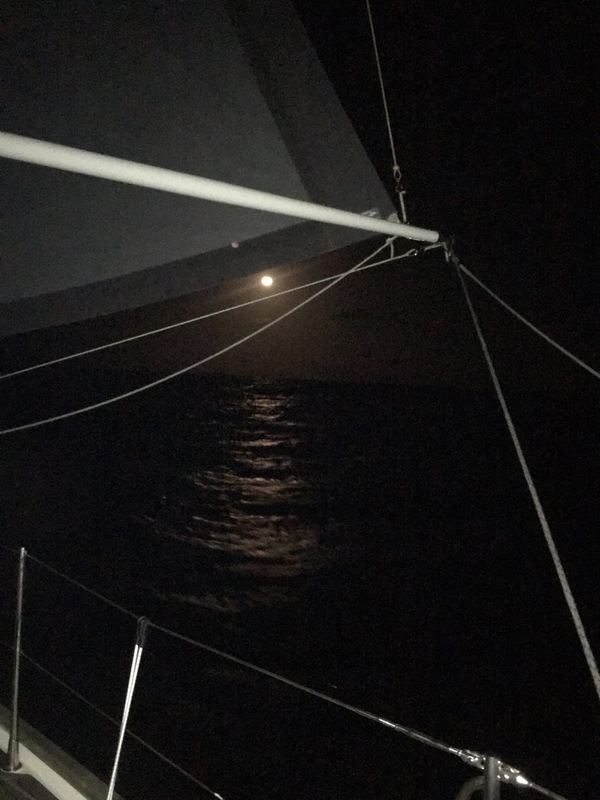 The wind is forecast to increase and the trade winds look to be set strongly from Saturday; which should whizz us all the way to Barbados, we are expecting 20-25 knots and 3m seas. That is exactly what we need although I have to admit to feeling a little apprehensive that these amazing light conditions will come to an end and we will have to lift our game. The thought of squalls; which are likely to come, will mean we have to keep very focussed on wind speed and clouds so we can ensure we reef down the sails in good time - Andrew has set some alarms to help. In very exciting news we caught a small Mahi Mahi yesterday afternoon - fish drill went to plan and we had fish n chips as a Friday treat for dinner last night. We hooked another this morning but sadly it got away - Andrew is still sulking!! We also had our first wildlife encounter on this trip with a fabulous display of jumping dolphins at sunset last night. With the impending rougher seas we have spent the morning ensuring everything is clean and tidy aboard, I have also been through our veggie box and the fridge to ensure all is well. A cucumber and one carrot got ditched - not bad considering many of the veggies came from Santa Cruz. Music today is the Kinks and my Podcast fav is currently History of the World in 100 Objects. Andrew is reading Tom Cunliffe on electronics; which apparently Tom hates so it sounds like a comedy from the quotes I am getting…. Nice progress... but a Kinks soundtrack seems wrong.